In 1919, the Boston Red Sox traded Babe Ruth to the New York Yankees to finance a Broadway show. In 1968, NBC turned off the Jets-Raiders game with only seconds left to show the made-for-TV movie "Heidi." In 1994, Tonya Harding decided the best way to win Olympic gold was by taking out Nancy Kerrigan's kneecap. In all of these situations, and many, many more, there is just one question fans can ask: What were they thinking? 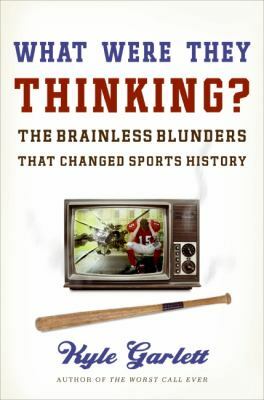 In these pages, sportswriter and fellow fan Kyle Garlett recounts the top sports blunders that made you tear out your hair, beat your chest in agony, and yell at the TV until your neighbors called the cops. Whether it's boneheaded coaches, idiotic general managers, or temporarily insane players, every fan has seen his team go from the brink of victory to total defeat for no logical reason. Whether it's baseball, football, golf, hockey, or any other sport, you'll discover what really happened during these painful moments and why they ended up the unbelievable way they did.